Detana!! 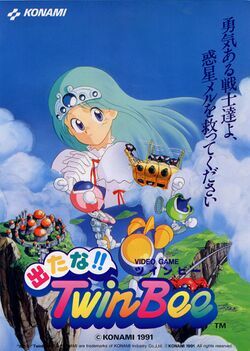 TwinBee (aka Bells & Whistles in Europe) is the fifth TwinBee game and the second TwinBee arcade game. This is the first game to make a full-figure appearance of the two pilots, Light and Pastel. It was release for the PlayStation and Sega Saturn as part of Detana!! TwinBee Yahho!, and for the PlayStation Portable as part of TwinBee Portable.